Fact: I can never figure out when I should arrive at Schubas for a show. When I arrive when doors open at larger venues for well known groups, it’s already too late and I’m doomed to be in the back of the venue, unable to see. Yet when I arrive when doors open at Schubas for a similarly well known group, there’s… no line. Despite knowing this, I’d expected mass chaos for the Andrew Bird show, which initially sold out in under a minute. This is a man who is a hometown hero, who attracted 10,000+ people to a show in Millennium Park and who sold out the Civic Opera House for two consecutive nights. I was anticipating a line and chaos and the end of the world. Instead… nothing, so I simply took my place up front against stage right. After much anticipation (and much eavesdropping; one of the neatest, albeit most voyeuristic, things about a small show with a hometown artist is that someone near you invariably knows the artist, or knows-someone-who-knows-someone), Alpha Consumer, a trio from Minneapolis, took the stage. 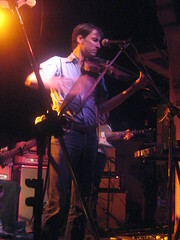 Two third of Alpha Consumer are Mike Lewis and Jeremy Ylvisaker, who are also part of Andrew Bird’s backing band. Their sound veers from typical indie pop-rock to experimental to alt-folk inspired pieces. The guys were hilariously irreverent during their banter: “This song is about cancer. Who here has cancer? Not too many people?” to “Who likes unicorns?” to some good-natured ribbing of “that Bird guy”. “Let’s see Bird do that,” said Jeremy after one particularly raucous number. “With his whistling and his… [miming violin playing].” They put on a great show, and while I selfishly want to keep them as members of Andrew Bird’s band (because the full band has helped amp up his music to epic levels), I want to see more of them and their music. After a short break, it was time for the real heart of the show. Andrew Bird was introduced by the head of Rock for Kids, the charity which benefited from the concert, and then Thax Douglas, Chicago’s very own rock poet, came out and read a poem, “Andrew Bird #8”. Then, of course, Andrew Bird plus band (Jeremy Ylvisaker on guitar, Matt Lewis on bass/tenor sax/clarinet, and Martin Dosh, whose beard deserves its own fan club, on assorted percussion things) came out. 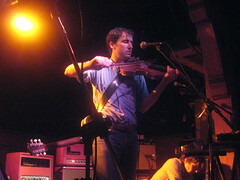 If you’ve never had the chance to see an Andrew Bird show, well, you should. Let’s just put that out there now. It’s always a delight to watch him perform, switching deftly between violin, guitar, and glockenspiel, all the while clapping and singing and whistling and stomping on his looping pedals. Watching him, you can only help but wonder what exactly is going on in his head, how he’s keeping track of the very layered aspects of his performance. He’s obviously a musician who puts all of himself into his music, and yet still makes the whole thing look terribly easy. While I adore all of his studio albums, the difference in feel between the recordings and the performances of the songs is at times unreal. Many of the songs off of Noble Beast are moderate in tempo, quaint and sometimes dainty sounding tunes. Played live, the tempo gets taken up several clicks and the songs are blistering with sound. Being up close, I also finally got to see just how deftly he manipulates the knobs and pedals for his looping system, which was fascinating to watch. 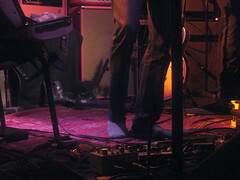 It also makes perfect sense now why he doesn’t wear shoes while performing: it’s not just to show off his fancy socks; he winds up twisting the knobs with his toes, which isn’t something you can do while shoed. He opened his set with “Sweetmatter”, which is combination of “Dark Matter” (from 2007’s Armchair Apocrypha) and “Sweetbreads”. Bird is notorious for constantly reworking songs over the years, and “Sweetbreads” was a predecessor to “Dark Matter”, featuring the same tune and some of the same lyrics. “Sweetbreads” is a bit darker, which he described in an older concert as being about what it means to eat the vital organs of other animals. In discussing the merging of the two songs, he said that he realized at the time, it wasn’t necessarily a good idea to release “Sweetbreads”, a song which contained a reference to mad cow disease (“cause it’s a question for the centuries / from communion to mad cow disease”). He said that it would have ended up as exit music to a segment on NPR or something. Later, after finishing a one-two of “Oh No” into “Effigy”, Bird mentioned that the chorus of “Effigy” (“It could be you, it could be me…”) originally was in “Oh No”, but he took it out, as he felt that there was already too much going on. A good choice, as while I don’t think that “Oh No” is overly cluttered, I don’t see where the lines would have fit. It’s probably got just about the right amount of “stuff” in it as it is. “Effigy” was followed by “Not a Robot, But a Ghost”, which is my favorite song off of the new album. It’s a recent addition to the setlist; he said that they haven’t played it live very often. Bird described it as exhausting, citing its technical difficulty. Knowing the genesis of the song (an article in the New York Times magazine mentions that it was written after the break-up of Bird’s long-term romantic relationship), I can’t help but think it’s emotionally exhausting, as well. There are some moments where the pain is almost palpable, made even more poignant by actually seeing the live performance. “Robot” was followed up by “The Privateers”, another song which has its roots in an older composition by Bird (“The Confession”, from 1999’s Oh! The Grandeur), and then with “Headsoak”, from the incredibly underrated The Swimming Hour, which has been getting its own revisions as of late as he’s been adding it back into regular rotation. He prefaced it by mentioning that he used to play it a lot with his original band, the Bowl of Fire (while he plays with a backing band now, he’s still conceptually a solo artist). Apparently, Kevin O’Donnell, the drummer for Bowl of Fire, was in attendance at the show. Anyhow, Bird said that he wrote “Headsoak” while living near Granville and Sheridan, in Chicago’s Rogers Park neighborhood, when living in a building mostly occupied by retired Jesuit priests. He said that he was walking down the street once had this feeling like everything was underwater, and wanted to capture it in song. “Headsoak” led into “Anonanimal”, which had a bit of a false start, with the violin pizzicato being entirely too fast. (It didn’t slow down much between the false start and what they wound up going with, but the rest of the band kept up just fine.) They switched things up this time, with Bird shifting to guitar midway through. He said that there were a few difficulties with the switch, or that it hadn’t worked perfectly, but for a man who embraces the natural chaos that comes out of a live performance, the difficulties weren’t even noticeable. The last two songs were particularly stunning versions of “Imitosis” and “Cataracts”, the latter of which wasn’t even on the setlist (it was supposed to be “Scythian Empires”), but which Bird decided to throw in at the last minute. “Cataracts” is confusing as hell on the surface (“when our mouths are filled with uninvited tongues of others” – really? I mean, really?) but I love it so, so much. The song gave me chills, so I have no complaints there. After a quick jaunt offstage (and by offstage, I mean stepping out the side door to linger on the sidewalk for a couple of minutes), Bird and company returned for their encore, the as always gorgeous “Some of These Days”, followed by a cover of The Handsome Family’s “Don’t Be Scared”, which I’ve grown to love after hearing it so frequently in his live shows. For a performer who is finally getting the mainstream attention that he deserves, Bird is still remarkably humble and down to earth. As a relatively recent transplant to Chicago, I unfortunately missed out on the days where you could catch Bird routinely playing at the Hideout or Schubas, but I can’t shake the feeling that he would be just as happy playing for a few hundred people as he would be performing in front of a sold-out Radio City Music Hall. Even though his show has gotten bigger and more intricate over the years, he looked as comfortable as ever, owning the small Schubas stage and having the audience pretty much eating out of the palm of his hand. I can comfortably say that this was one of the most special, magical concert experiences that I’ve ever had. There was the feeling of knowing that something like this may not ever happen again, which made every moment all the more precious. I was at the Schuba’s show (fortunate enough to win tickets, because Lord knows it sold out in the blink of an eye.) And I couldn’t agree more that Bird is something of a jem. I’ve lived in Chicago all my life and I live in Rogers Park; he’s my hometown hero. Oh, and “not a robot” was the most fantastic song he’s ever played live.